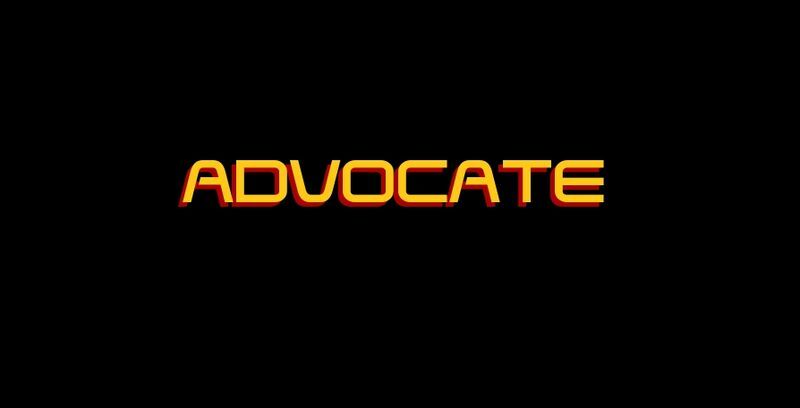 OOC Notes: Advocate is the main powerhouse superhero of the player @Greivance. 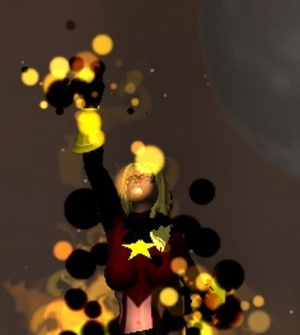 Her concept is inspired by fantastic heroine known as Ms. Marvel. It is very Silver Aged with her philosophies and ideals current but 'old fashioned'. Her powers connect her to the universe itself on a grander scale of things so she has some type of understanding on how it works. Most of this information should be considered OOC. Her identity is not public and currently under UNTIL's files. Only heroes she comes into contact with know of her true identity or villains who use it against her. "Who will be the lighthouse in the darkness? Who will lead the wayward lost hope for humanity to the shore of Justice? When all else fails my cosmic light will be that beacon in the sky." Sharon Ann Deacon was born on July 4, 1987 to Barbara and Jeremy Deacon. For a short while Sharon grew up in the historic town of Petersburg Virgina while her father served in the army. When Sharon was the tender age of two her mother became gravely ill and was omitted to the Southside Regional Medical center on September 2, 1989. On September 16, just two weeks into the hospital, Barbara Deacon had died and Sharon her father were left to move on without her presence. This took a toll on Jeremy in more ways than he could explain to Sharon even as she grew up. They relocated to base after base as her father's tasks with the military demanded him to be moved and his position and rank grew more prominent. This broadened Sharon's horizons as a youngster while she traveled with her father to different places in the world. She saw various things and many people from all walks of life which held her intrigue. Even as a young girl Sharon had that spark in her that knew she had to do something and had the potential to be a positive light in the world. Before Sharon's 14th birthday her father Jeremy and herself moved to another base on the island state of Hawaii. Sharon had grown up quite a bit and was becoming a young woman even before learning the curriculum of a high school student. She had only known of Jeremy as she got older despite his constant reminders of her striking resemblance to her mother which she took in stride. However, she longed for some sense of stability in her life which got her down at times. Jeremy reassured her that the hectic routine of being an army kid is a good thing and that one day it'll come in handy when she's out on her own. Being dismissive and rebellious to her father's words Sharon just hoped nothing else made her life anymore abnormal than it had been. On June 23 around 10 P.M. and Sharon was enjoying her time out on the beach. It was a night of reflection since Jeremy worked late hours and eating dinner alone was not her favorite thing to do to pass the time. She didn't have many friends and her father kept the boys away. Her only comfort was the ocean and the starry sky above her that a bustling city would cancel out. Sharon saw a twinkle near the North Star and believed it was her mother looking at her from heaven and thought not too much of it until the bright light was moving and growing brighter by the second. She couldn't believe her eyes as the falling star hurdled down towards her direction. Sharon thought she was about to die before the trajectory of the object skewed off into deep into the woods. The sirens to the base rang loud as whatever fell from the sky made impact erupting a dirt and fire cloud into the air. Sharon never seeing anything like this before decided to go check it out before the military arrived, or worse her father Jeremy to yell at her for being out so late. She hurried into the woods rustling and snapping tiny branches that scared the remaining wildlife from her path as she headed towards the dim light gleaming off into the distance. About a few more feet and Sharon had made it to the crash site. Little wicks of fire latched on the limbs of the decimated trees that were in the path of the object as she got closer enough to see into the crater. Smoke arose from the pit as she squinted her eyes to get a better look at what had fell. In the backdrop of the forest Sharon could hear the sounds of the tanks and troops getting closer. Panicking she lost her footing and tumbled into the pit where she stopped short of the object which to her was just a steaming rock. Sharon frowned and got up dusting herself off before the meteorite began to crack then split open to reveal its insides. The light emitted from inside of the meteorite was too bright and caused Sharon to shield her eyes. After a moment her eyes eased and adjusted to the light and what Sharon saw made a smile settle onto her face. Little stones that resembled diamonds stationed inside the meteorite sparkled under the dim moonlight from above. Sharon couldn't help herself and proceeded to reach out and see if they were real. Suddenly, before her hand could touch the pile of the diamond stones she was hit with that same light that shined once the meteorite split. It coursed throughout her entire body like a flame making her scream in pain as the energy transferred from the stones to Sharon. Images and power rushed into her at an alarming speed overwhelming her to the point where the reaction was too great and Sharon was cast up and out of the pit into a withered tree. As she began to lose consciousness she heard the military closing in with her father Jeremy's voice hollering in a muffled state for help before she blacked out. Oahu the night of Sharon's encounter with the meteorite. On October 27 a few nights before Halloween Sharon and friends decided to spend the evening going over costume ideas for a party that weekend. Overly excited by the occasion she had completely stayed out later than she was suppose to. Sharon hurried home as fast as she could before her father could chew her head off. As she made way to a crossing section she noticed a young boy playing near the street. Sharon thought nothing of it at first but as she got closer the child had apparently lost his toy into the street and an eighteen wheeler was coming by. Having little time to react and upon instinct Sharon ran to the little boy as he froze in fear. She surrounded and shielded the little boy from the truck by putting her back to it like a barrier. Her eyes closed immediately preparing for the worst to happen when everything went silent. For a moment she stayed held in suspense for all she saw was darkness but could feel the heat from light around her. She opened her eyes slowly in a blinking manner to discover in fact she was indeed alive but covered by a magnificent light. Sharon looked down to the boy as he clutched himself onto her then around the surrounding area to where all she saw were mouth agape, speechless civilians all looking at her. She was just as puzzled as they were then took a glance behind herself to see the truck with her body indented into the grill. Sharon was devastated and quiet until something within her told her to move. With the little boy in her arms she shuffled herself from within the front of the truck engulfed in the golden light until she saw the aftermath. Sharon felt like the spotlight was on her as sirens blazed in the air off in the distance a few streets away from the accident. She unwrapped the boy clutched onto her person as she finally snapped back into reality. All she knew or wanted to do was to run and she did. She backed away from the crowd enclosing around the boy. Each step backwards turned into a light power walking before Sharon turned completely into a run not looking back and engulfed in the bright light that wouldn't seem to go out. Its November 13, 2003 a little over two weeks since the incident and Sharon has been more quiet than usual. Her father Jeremy was concerned like any father should be. That is, if their children acquired super powers from a meteorite. Jeremy didn't want to pry but he knew something was wrong. It could be a number of things that he was prepared for even if they could lead to an uncomfortable dead end. He was about to knock on her bedroom door before she rushed out, kissed him on the cheek and continued on out of the house with her backpack draped over her shoulder. It wasn't that she didn't want to talk it was more so trying to figure out what to say. 'Hey Dad you'll never guess what happened? I got super powers from that meteorite that almost killed me and I saved a little boy by stopping a truck. Cool or what?' Sharon thought in her mind before face-palming hard. As she did this a spark of the golden light came out of her palm almost like a firecracker before vanishing away into thin air. Sharon looked around frantically to see if anyone saw then took a detour to an alleyway instead of heading towards school. She grasped the hand that had sparked the luminescent anomaly and stared in awe and fear. Why was this happening to her now, it was already hard enough fitting in to society being an army brat but now with powers? Sharon had always read or heard about superheroes more often than she should've due to Jeremy's line of work but never had thought she would turn into such. She toyed with her hand before another flicker of energy emerged from within her palm. It shot an unfocused and pure raw beam of light into a trashcan that was completely disintegrated. Sharon couldn't believe it for one second and a bright smile graced her face because of it. From then on Sharon began to practice and see what she could do with her powers. Liberation confronting a group of street hoodlums. In August of 2004 after months of practicing with her powers Sharon had decided to dub herself a hero name as her senior year came around. She had done various acts of heroics ranging from carjackings to bank robberies and from cats in a tree to saving civilians from fires. On August 21, Sharon chose the name of Liberation. It didn't take long for the young Sharon to become famous of her exploits as a heroine. Liberation was seen in newspapers, on the internet, and even featured in a short snippet of a televised special called Heroes of Tomorrow. As her name spread Sharon was also introduced to other meta-human teens around her area that she teamed up with from time to time. During the middle of Sharon's senior year in high and right before the new year a collective group of young heroes including Sharon formed an alliance that would be known as Hero Time. A team that consisted of six young heroes including Sharon herself that fought crime but eventually disbanded. The group consisted of Prior the tech savvy leader and strategist, Straightshot the nimble archer, Crucible the young witch, Taobane the Native-American shape-shifter, Impact a rowdy powerhouse changing kinetic energy into brute strength, and Sharon. This page was last modified on 25 March 2014, at 15:51.